Likud leadership candidate Benjamin Netanyahu said Monday he would cooperate with his rival Foreign Minister Silvan Shalom. "Cooperation with Silvan Shalom will be resumed tonight, not tomorrow morning. We will work together and lead the Likud to accomplishments," Netanyahu said while arriving at a Jerusalem voting station with his wife Sara. 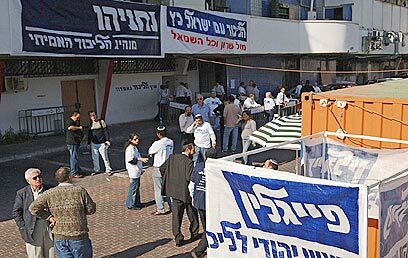 The Likud primary elections opened Monday at 10:00 a.m. in 180 different locations throughout the country. The party's 128,347 voters will determine who will serve as their chairman. The voting stations will be locked at 10:00 p.m.
Four candidates are competing for the role: Benjamin Netanyahu, Silvan Shalom, Yisrael Katz and Moshe Feiglin. By 1:00 p.m., only 10.2 percent of Likud members had voted for their choice in Likud leader. Party Secretary-General Arik Barami said the voters' turnout is identical to the number in previous years. He estimated that the final turnout would reach 45 percent. Foreign Minister Silvan Shalom arrived at a Ramat Gan voting station at 10: 30 a.m. to cast his vote in the Likud primary elections. Shalom was accompanied by his wife Judy, and said he was convinced of his victory and his ability to return Likud voters who had moved to Kadima. He also called on his party members to arrive at voting stations and cast their ballots. "I hope to bring about a revolution in Likud. Today is an important day and people should show responsibility and take part in this political revolution," Shalom said as he left for a tour of his headquarters throughout the country. Shalom also demanded that Netanyahu commit himself to staying in political life and in the Likud even if he loses the elections. 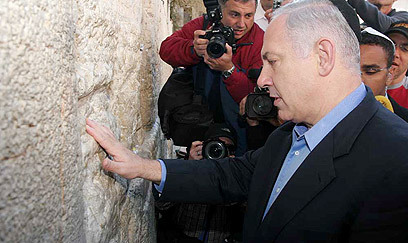 Knesset member Benjamin Netanyahu visited the Western Wall in Jerusalem Monday morning and said that he was praying for the prime minister's well being. "However, the important thing is the state's health, which is not good," Netanyahu added. The MK was received with cheers by some worshippers at the site and with jeers by others, who shouted at him "you ruined our lives." 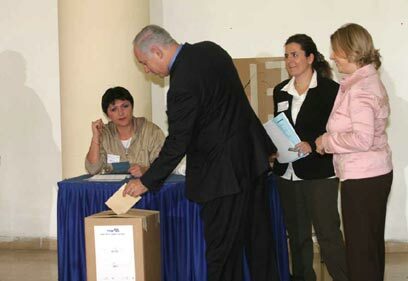 Agriculture Minister Yisrael Katz and his wife cast their ballots at Moshav Hatzav. Katz said the first step he would take if chosen as party leader would be to renew the Negev laws. Meanwhile, Likud leadership candidate Moshe Feiglin's supporters said they were optimistic over the high voters' turnout in the party's primaries. "We are against all those who supported the disengagement. 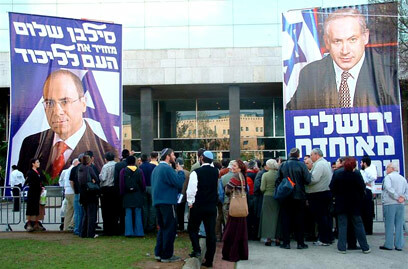 Bibi is ahead in the polls, so there is no risk we will see Silvan Shalom as head of the Likud," a Feiglin backer said. Meanwhile, Education Minister Limor Livnat has launched an initiative to reserve the second spot in the party's Knesset list for the person who will lose the primaries. According to Livnat's aides, "continuing the internal battle may create a rift, which will cause Bibi to turn right a day after elections if he his defeated. While Silvan, if defeated, will cross the road to Kadima." "The party is destroyed, and we must unite the ranks in order to defeat Kadima," one aide said. MK Michael Eitan shares Livnat's view, saying that the battle between Netanyahu and Shalom has been conducted carefully, but that the candidates should still focus on presenting their virtues and less on blasting each other. "In terms of Israeli politics' regular norms, both of them have not crossed the line," Eitan said. Ynet reveals that most of the party's MKs support Netanyahu's candidacy for Likud leadership. Netanyahu is supported by 10 Knesset members, while only two MKs have quietly expressed their support for Shalom. Another seven have not announced whom they plan to vote for. Senior Likud officials said the members who support Netanyahu are taking a political risk. According to estimations, if Netanyahu would become Likud chairman and Sharon will form the next government, Likud will make its way to the opposition, while if Shalom wins the primaries, there is a good chance Likud will be part of Sharon's government, a Likud official said. See all talkbacks "Bibi: Shalom and I will lead Likud"